With our euro prepaid currency card, you load it up with euros then use it in the same way as a debit or credit card. However, the advantage of our euro prepaid card is that you will avoid the expensive fees debit and credit cards usually charge and furthermore we will fix the rate of exchange at the time of topping up so you avoid any nasty fluctuations in the currency market. You can top up the card whenever you want to and, if you lose it, you can cancel the card with ease and prevent anyone else from spending your money. You’ll also often be charged for withdrawing cash on your card – you’ll typically be hit with a cash transaction charge of between 2% to 4.5% and if you’re using your credit card, you’ll be charged interest on top from the day you make your withdrawal. However, as we specialise in Foreign Exchange our currency card allow you to avoid all of these fees altogether as there are simply no fees for using our service, we simply fix the rate of exchange at less than 2% of the interbank rate at the time of topping up. That’s it, so €200 euro is €200. If that’s not enough we have gone one step further to help save our card holders even more on their purchases. 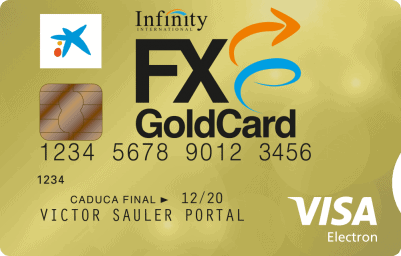 When you use your FX Gold Card at participating outlets across Spain you’ll enjoy added benefits and discounts. 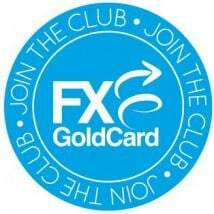 Just look out for the FXGoldCard Logo or visit www.fxgoldcard.com for a list of participating businesses. With a traditional debit or credit card there’s always the temptation to spend that little bit more than you’d originally planned. But with our prepaid card, you can only spend what you’ve put on it, making it a useful tool for ensuring you stick to your budget. You can keep an eye on exchange rates and load money onto your card when the exchange rate is favourable this is then fix for your peace of mind. Don’t let a bad day on the currency markets affect your money, remember a traditional debit or credit card will be set at the time you make the purchase or withdraw cash, this can be volatile. With our card you will know exactly what you’re paying for goods and service as your rate is fixed. If you carry around cash and your wallet gets stolen, your cash will be lost forever. But if your FX Gold Card is stolen, we will arrange a replacement via our 24/7 Multi-lingual helpline. 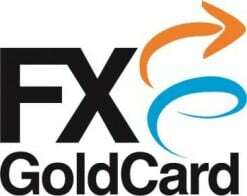 The FXGold Card has the added advantage that it isn’t linked to any of your other financial accounts, such as your current account, so limiting your liability. Infinity International Limited is registered with the Financial Conduct Authority under the Payment Service Regulations 2009 FRN 567835 for the provision of payment services.